Graham Wilde began writing in 2009 and writes on a range of subjects, specializing in sports and fitness. Currently, he is a swimming and fitness coach based in Edinburgh, Scotland. He holds a Bachelor of Science in sport and exercise science. Wilde graduated with distinction from Napier University in 2006. The skills required for swimming are acquired gradually, and children will learn these skills at different speeds. The motivation of children to learn is a factor, and each child has a unique level of potential. The drills that you practice with children can help learners to reach their potential in the quickest possible time. As children practice the drills, they will become more competent at the skill and will begin to perform it automatically, leading to successful swimming of the recognized strokes. After a child has gained some initial water confidence you can teach him the essential early skill of pushing and gliding. Initially you can teach him to start from a standing position and push off the pool floor with his feet and reach for the poolside. 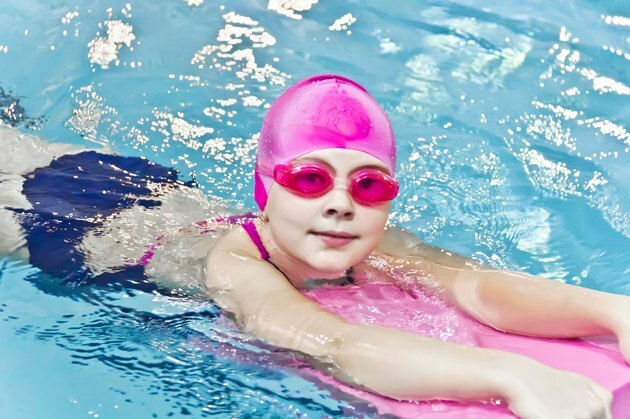 This is a particularly useful drill if the child is still a non-swimmer, as it introduces the skill that forms the basis of swimming starts and turns. You can then teach the child to push away from the side and glide to a partner who can catch him. As confidence improves, learners can progress to pushing, gliding and standing up on their own. You should teach children to do this drill with their arms outstretched and face in the water with the toes pointed. This introduces the streamlined body shape that forms the basis of swimming starts and turns and the correct body position for swimming front crawl. The front crawl leg kick is characterized by a continuous, alternating action. There are several drills that you can use to introduce this element of the stroke to children. An introductory drill is the leg kick while holding the rail at the side of the pool. Teaching points that you should highlight are that the toes should be pointed throughout the drill, the kick should start from the hip and that the leg should be straight during the upbeat of the kick and slightly bent on the downbeat as the leg accelerates. As the children become more proficient at performing the leg kick while holding the side of the pool, you can introduce them to the drill while holding two floats and later on, just one float, progressing to leg kicking without using any buoyancy aids. The arm action in front crawl provides continuous propulsion and it is characterized by its alternating action. You can introduce the front crawl arm action to children with a drill from a standing position in the pool. You should demonstrate the hand entering the water in line with the shoulder with the elbow bent. As the hand enters the water, the elbow straightens and the arm should be stretched forward. The catch is achieved with a downward and backward movement. You should continue by demonstrating the downsweep with your elbow bent, the insweep with the hand sweeping inward to the center of the body followed by the upsweep and recovery to show the continuous arm action. The idea should be to splash as little as possible during the drill.